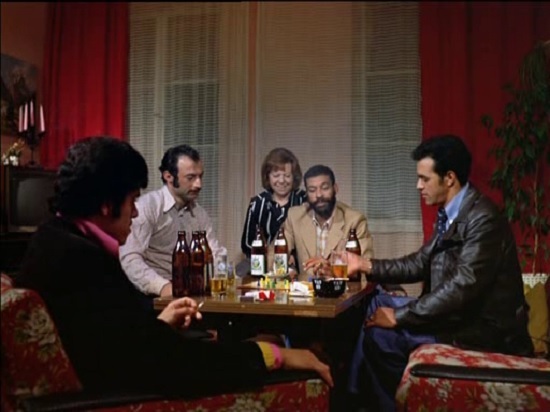 Ali: Fear Eats the Soul (1973) is considered as a crowning achievement in German cinema and is one of the master works of the great German director Rainer Werner Fassbinder. The film won two awards at the 1974 Cannes Film Festival and the lead actress Brigitte Mira received the German Film Award for her performance. 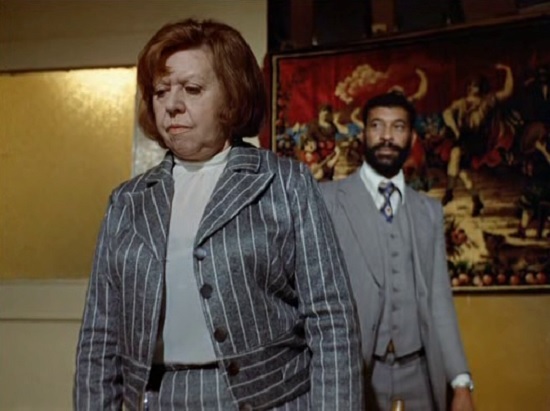 Fear eats the Soul is apparently a simple tale but the way Fassbinder has constructed it gives the film an aura of purity and nobility. The film opens when Emmi (Brigitte Mira), a sixty year old charwoman on her way home from home enter a restaurant apparently attracted by the enchanting Arabic Music played there. There no customers except her and as she sits down, the barwoman and the customers standing far from her stare at her as if she is an intruder. 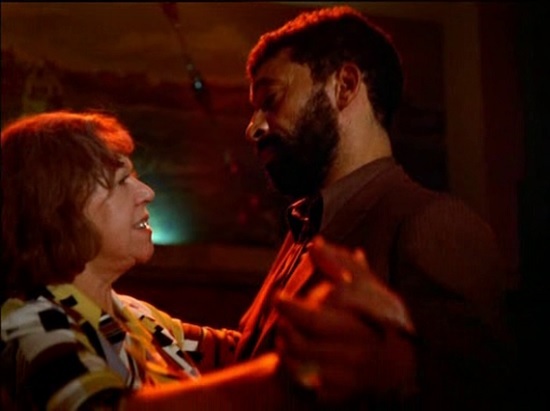 A blond in the bar taunts Ali (El Heidi ben Salem), who works as a car mechanic and a regular there, and asks him if he can acquaint and ask the just arrived old woman Emmi to dance with him. He does it and during the dance he tells her that he would accompany her to her home. A strange and unlikely friendship develops between Ali and Emmi which soon develops into romance and soon they are living together in Emmi's flat. Out of a professed sense of responsibility but also hopefulness, Emmi first confides in her newfound love when she goes to visit her daughter Krista (Irm Hermann) and her tyrannical son-in-law Eugen (Fassbinder himself) and announces that she is in love with Ali; Eugen thinks she is screwy and Krista as well can only think that her mother — who has been a widow for years — is fantasizing. The first real threat to their relationship comes with a visit by the landlord’s son, who has been sent on the assumption that Emmi has taken in a lodger to point out to her that sub-letting is against Emmi’s tenancy agreement, and that Ali must leave within a day. Impulsively, and fearful of losing this new joy in her life, Emmi claims that she and Ali are planning to marry to alleviate this little difficulty. This changes everything for the landlord’s son, the only character in the film who consistently accepts their relationship as unproblematic. After he has apologized for the misapprehension and departed, Emmi speaks to Ali with embarrassment of her having invented the idea of their marrying but, to her surprise and delight, Ali concurs that it is an excellent idea, and soon they get married. In the ?rst part of Ali: Fear Eats the Soul, the oppression comes from Emmi’s children, neighbors, and coworkers. The turning point is the couple’s decision to take a vacation in Steinsee to escape the discrimination, convinced that upon return, they will have been missed and will be welcomed back. After they come home, they ?nd, as Emmi had hoped, that everything is different around them. We now see social ostracism turning into accommodating exploitation and the neighboring tenants and shopkeepers see the utility for them in keeping Emmi in their good graces. But now the oppression comes from within, from the power imbalance between the two of them. She has power over him because she is a German in Germany, but he has power over her because he is younger and sexually attractive. Out of longing to sustain her old friends’ apparent renewed respect, Emmi begins to neglect Ali and adopt some of their attitudes toward him. She demonstrates her typical “Germanic” behavior - more readily ordering him to do things. When co-workers visit and remark on how surprisingly clean he is and comment on his muscles, she shows him off as if he were an object. Some days later, Emmi doesn’t cook Ali couscous, his favorite dish, insists that he eats German food, and shows Germanic attitude, more due to her desire to fit in with the toxic society around them. 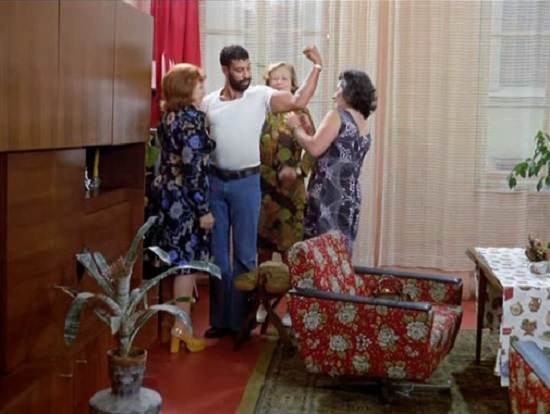 This and Emmi’s objectification of him triggers Ali exit and he goes to seek comfort in the arms of the female bartender Barbara (Barbara Valentin), who used to cook for him, and with whom he has apparently had dalliances prior to meeting Emmi. Emmi grows desperate at his being out all night and visits him at work, where he pretends he doesn’t know her as his workmates make fun of her age, calling her Ali’s Moroccan grandmother. Just as their relationship turns beyond repair, Emmi goes back to the bar to meet with Ali as has the bartender put the same song on the jukebox that led to their first-ever dance. He responds to the implicit call for reconciliation from Emmi and asks her to dance again. While dancing, Emmi emphasizes that she knows she is old and that he is free to come and go, but urges him to see that the only thing that’s important is that when they are together, they must be nice to each other. He agrees and they re-declare their love for each other and the priority they will recommit to each other. At this moment, Ali collapses in Emmi’s arms from what turns out to be a burst stomach ulcer. We last see Emmi with Ali in the hospital, where the doctor tells her the illness is common among migrants because of the stress they face in everyday life due to prejudice; the doctor adds that Ali will have surgery to remove the ulcer, but will probably be back in 6 months with another ulcer. 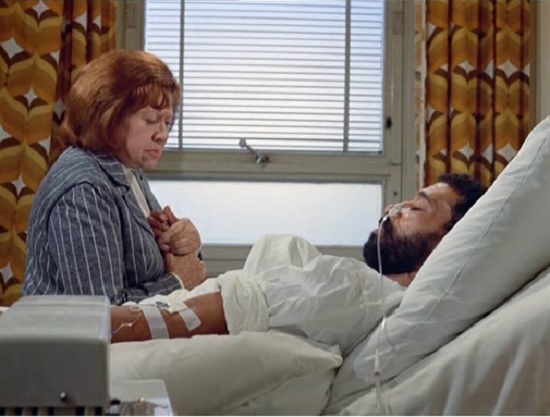 Emmi declares that she will do everything in her power to reduce that stress and, as the film ends, she is at his bedside, holding Ali's hand. 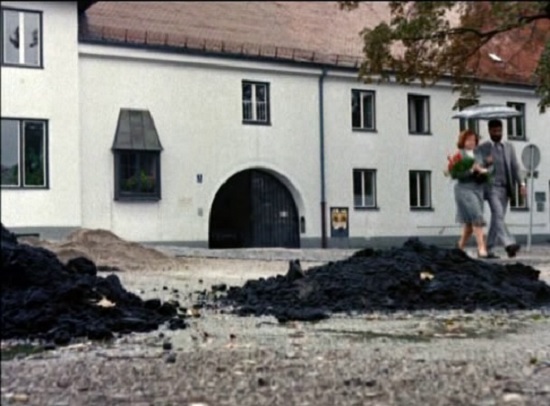 Fassbinder uses a variety of simple techniques to demonstrate loneliness and alienation in Ali: Fear Eats the Soul. 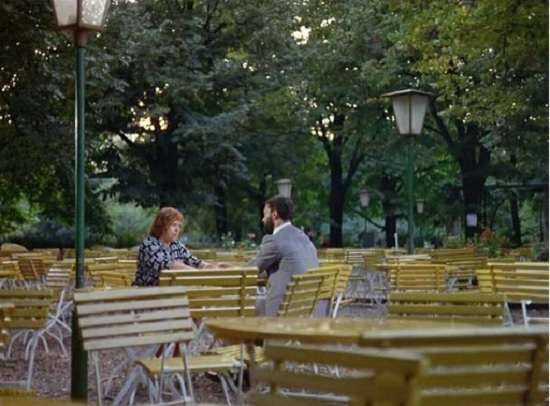 To show the couple’s predicament, Fassbinder uses a complementary pair of expressive ?gures, the ?rst based on the restriction of the ?lm frame. The doorway to Emmi’s kitchen becomes a variable frame that traps characters in their unhappiness (as when she’s left alone after Ali goes out for couscous) or that encloses a moment of intimacy stolen from loneliness (the couple’s ?rst private time, when Emmi gives Ali brandy). In the several scenes set on the staircases of Emmi’s apartment building and of the building she cleans, intrusive vertical forms (columns, pipes, window and door frames) divide the characters and make their power relations instantly readable. The second expressive figure—a wide shot revealing the emptiness around the couple—appears at moments when Emmi and Ali are most together. As they emerge from the registry office in the rain, the solitude and indifference they’re up against seem to take on visible form: piles of rubble in the middle of the ground, the lone car that passes in the background. Visiting an outdoor café, the couple find themselves marooned in a sea of yellow tables—across which the camera tracks toward them in an instinctive gesture of sympathy. The scene in the fancy restaurant where they celebrate their wedding unites both expressive ?gures: an interior doorway ceremoniously frames the couple, while on the camera’s side of the doorway, empty tables testify to the absence of any social context for their happiness and any support for it. There’s a sense throughout the ?lm that the world has become still — a feeling of timelessness, conveyed not just through the long, strange moments of silence and immobility, but also through the way the characters of Fear Eats the Soul constantly generalize about life in their dialogues: “Fear eat soul” (Ali’s dialogue when he meets her first in her apartment). “Time heals all wounds.” “Money spoils a friendship.” “In business you have to hide your aversions.” “Half of life consists of work.” “Germans with Arabs not good.” “Think much, cry much.” “Dark clothes look so sad, don’t they?” “It’s no fun drinking alone.” The sententiousness of these lines adds to the ?lm’s impression of stillness. In them, a way of looking at life has solidi?ed and become accepted as natural and permanent. The stillness of the ?lm is deeply sad. But in the middle of all this sadness lies the possibility Emmi and Ali create when they ?nd each other. The ?lm draws its immense force from its concentration on two simple facts: the world’s indifference and the couple’s love. Much of the beauty of Ali: Fear Eats the Soul comes from the performances of Brigitte Mira and El Hedi ben Salem. All the details of Mira’s Emmi are vivid and affecting: her resignation, her intelligence, the mixture of stubbornness and hesitancy with which she faces her life, the fundamental optimism implied in her graciousness with people (as when she chooses to ignore the malice of the neighbor who seizes an inopportune moment to repay a trivial loan) or in the pleasant way she serves Ali brandy. The fear in question in “Ali: Fear eat the soul” is that of the unknown and of the unfamiliar. Every character except Emmi is afraid of something — though most are simply xenophobic and/or racist. 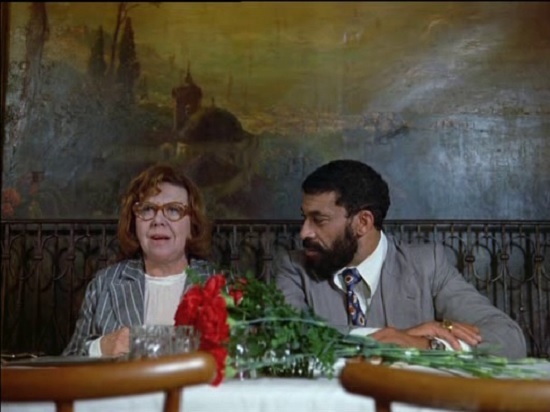 (Fassbinder drives this home when Emmi and Ali dine in an otherwise empty restaurant once favored by Hitler.) Eventually even Ali proves afraid, afraid of a stagnant life with a rather dull, older woman. We can see him wondering, though he is a man of few words, what made him marry her to begin with? 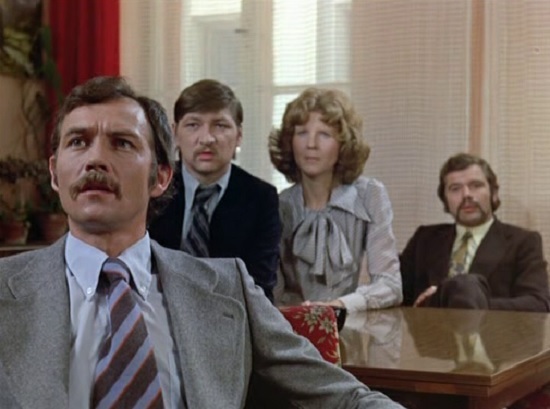 In summary, this 1974 film stands as one of Fassbinder’s sturdiest achievements, posed between the low-budget funkiness of his early features and the mannerism of his late period.